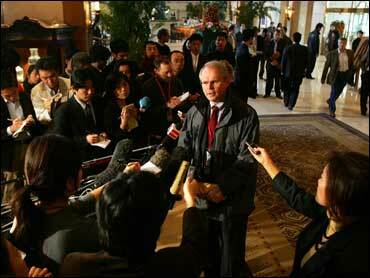 Christopher Hill, nuclear negotiator, media superstar. Little known in his home country, the boyish-looking U.S. assistant secretary of state has become a celebrity in China's capital and not just for his role as Washington's chief envoy in talks on North Korea's nuclear weapons program. "He's so charming and attractive," said Li Kenna, a desk clerk at the five-star hotel Hill stays at in Beijing. "He sometimes asks me how I am in the mornings. He's one of our nicest guests." Hill — who has faced down Slobodan Milosevic and barricaded himself against mobs in Macedonia as a negotiator in the Bosnia and Kosovo crises — has been making periodic visits to Beijing for years, with troops of reporters flying in from South Korea and Japan to cover his wrangling with Pyongyang over a deal that would rid the communist country of its nuclear weapons program. His easygoing manner has also won over the media, in comparison to the stonewall public relations efforts put forward by some of the other countries in the talks. And with the negotiations taking place for hours on end behind closed doors, the idle time fuels speculation and jokes about Hill. At the last round of talks in December, a Chinese TV producer gave Hill, who is married with three children, a Christmas card. The interest in Hill may also stem from the fact that he speaks every morning and evening to the media, while his North Korean counterpart, Kim Kye Gwan, gives only the occasional chaotic news conference. Hill, a Boston Red Sox fan, also won over the Japanese media by turning up for meetings in Tokyo wearing a Seibu Lions baseball cap — the Red Sox had just signed pitching star Daisuke Matsuzaka from the Lions. Concerns about Hill's health — he has been sick several times in the cold Beijing winter and looked ill several days ago — have elicited almost motherly concern from some female reporters. "Ambassador, are you feeling OK? You don't look too well," a South Korean reporter, Koo Hee-jin, asked at one news conference during the latest round of talks that started on Thursday. A career foreign service officer who has served five presidents, Hill speaks Polish, Serbo-Croatian, Macedonian and Albanian. Hill, who is on the evening television news every day he is in Beijing, has also been mobbed at the Beijing airport with Chinese travelers rushing over to have their picture taken with him, said one of Hill's security officials, who asked not to be named.